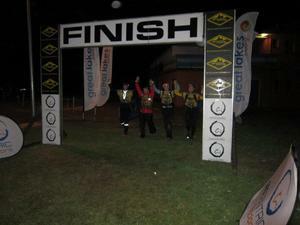 48 hours adventure race- what a challenge! Geocentric always run great events. 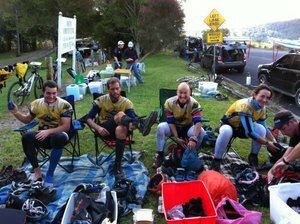 After Thredbo XPD 2008 and World Championships in Tasmania could we stay aside when opportunity to get some fun is so close?? Just a bit over a thousand kilometers and a bit over thousand and half AUD. Of course, not, especially when the team to race with consists of Jarad Kohlar the best Australian adventure racer and James Pretto who is ‘Damn good’ and certainly plans to challenge Kohlar in upcoming years. 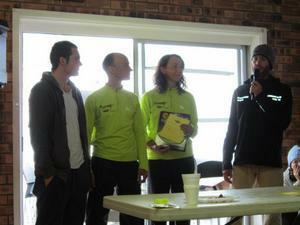 I and Serge did not feel very well after running Lysterfield adventure race. Each race you organise takes a bit of your fitness, you don’t sleep enough, and you do not eat enough (which is probably not bad for me, but not good for Serge) and obviously do not train enough, which is bad for your team mates. However, we’re not those who miss the opportunities and we jumped on board of the team Peak Adventure Junkie replacing Deanna Blegg and Darren Clarke who eventually became our absolutely amazing support crew. 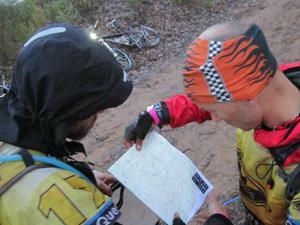 As always the most challenging part of the race was to get to the start place, arrange gear, food and prepare maps. Even if it seems to be enough time- three of us arrived to the start one day before the registration, it’s not enough, last night we had not much sleep, sorting out food and other stuff. 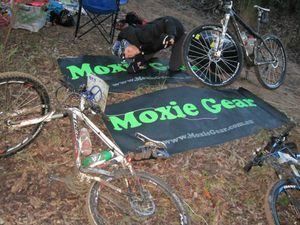 Luckily, this was a race with support crew and our support crew was the best, we knew about that, so I would say honestly did not sort all our gear very well, just put everything into the boxes and left to Deanna and Darren. The most remarkable race preparations had James, arriving at the accommodation 10 hours before the start after his Uni exams and then departing to exams after the race straight after. That’s why this guy called Damn good.. and moving ahead, he passed all his exams and he finished second in Geo. The first stage was tubing, we had a lot of discussions about the best way to do it and a lot of preparations done mostly by Serge who had to removed all truck tubes out of tires in truck tire center somewhere in a middle of the way between Sydney and Forster. At the start there was a bit of a show. 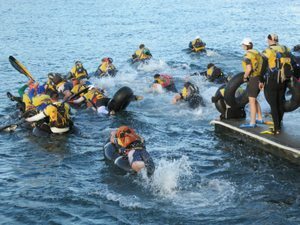 Some teams ‘paddled’ sitting on tube each person separately some made kind of raft, some teams swam using fins lying partly on tubes. Our strategy was to lay on tubes as a raft and swim using hand paddles. James as a fastest swimmer with massive triathlon background supposed to be separately for the first bit but then we engaged all together and it worked really well. The result was terrific, we put about five minutes on Mountain Design (who used strategy to sit on tubes and paddle with actual kayaking paddles) and even more on Macpac with their strategy to swim with fins. 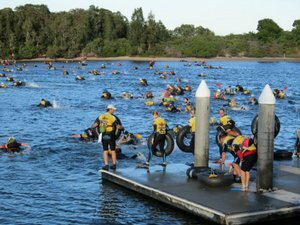 The first stage was about 8 kilometers with serious amount of swimming/tubing. Without many things to do in transition area we jumped into our surf skis and literally flew away. 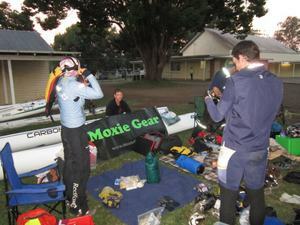 The fastest boats, fastest paddlers, the fastest support crew is easiest way to describe our team at that stage. There were no chances even to eat something more than one or two gels during each kayaking stage –very fast and short for us. Quick change in TA and the first challenge- to find CP somewhere on ‘high point’ on a map with very bad printed contour lines. A bit of running though the stunning shoreline and we’re in thick bush, that’s where race begins. Only guessing where we were somehow we managed to get that CP and arrived to next TA still leading the race, again quick TA and we’re on bikes. That where we used fair bit of our luck. In my opinion every team has about the same amount of good luck and bad luck for the each race. Met Macpac at the officials tents, we’re checking out they are checking in. Then too much excitement went into the scene and after 500 meters we realized that we left trekker in TA. That could be fatal error if we did not notice that in time, which could cost up to 4 hours of penalty in Geocentric races. 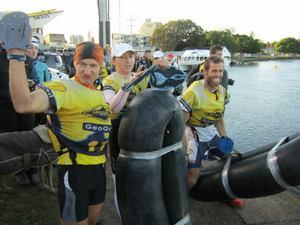 We know that after this World Champs when Seagate leading the race also forgot their trekker in PFD and was penalized by serious time and lost their chance to win. Even though we did not lose our chance to win, our lead was now under the big question. Now bad luck came into force. Seemed being very smart route choice turned into few kilometers hike with bike though the bog. That proved the theory of trying to be the smartest you increase chance to become the biggest loser. 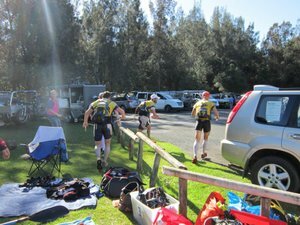 Anyway by the end of the stage we still were first and came to the lake crossing couple of minutes ahead of Macpac. Jarad and James swam into the other side- to build up raft and bring it to this side for transporting bikes and poor shivering Serge and Maria to the other side. At the same time Damon and Rob also swam and performed the same exercise. Our teammates were a little bit more energetic and came first, with crocodile’s tears we dropped our bikes one on other one and got to another side. Again led by our incredible support crew Deanna and Darren very fast transition and we’re on water on our flying Carbonology and V10. Fabulous sunset , gorgeous views, less then hour of paddling and we’re in mastering hands of our support crew who always in time despite of our fears that they will not. Daytime is over and nightmare began. In our opinion obvious route choice along the spur line was not it. Rob and Kathryn proved to be outstanding navigators picked up better choice as well as better pace. Also lack of vision came into play, we’ve done a bit of mistake half an hour cost and Macpac took the lead after this trek. Would not say that was unexpected. However, being naturally utopian optimist, I did believe we could win. A little bit slowed down in TA but still full of energy we started MTB stage in the middle of the night. That was highlight of the course- muddy and steep uphills, some technical downhils. We did quite well up to the last CP when we again decided to be smartest and picked up not the best route choice of the trek which eventually completely disappeared. A bit of discussion whether we should bushbash to somewhere though the blackberry and other nice spicy plants or turn back and look for better option. Hundred meters back and tiny trek though the bush appeared exactly to the direction where we supposed more or less existed trail should be. Ended up at the farm where ‘road’ was more in our imagination then in reality, eventually we got to the start of normal roads and arrived to TA. Despite all these adventures we’re 2 minutes faster than Macpac during that stage. Here was sunrise and start of the stage when we finally lost our chances to catch up with Macpac. The stage was rogaine where you can skip one CP. Taking into account distance more than vegetation we picked up not the fastest option and completely established on 2nd place. Three more stages to go, now MTB where you can split into pairs to take two CPs at the same time. James got flat tire and their pair went a bit slower than me and Serge (also their distance was slightly bigger). Second part of the stage when we joint again was nice and fast and we hit TA by the start of civil twilight which was great and gave us a chance to finish by the late dinner. 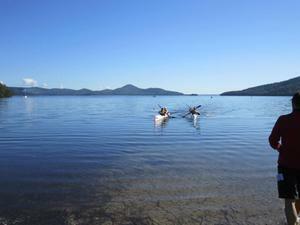 The last but one stage – kayaking to the final trek with one CP in graveyard when you need to find photo CP. Not an easy tasks apparently, first step to find graveyard and second –to find actual grave. First part was masterly made by Serge and the second by Jarad while me and James just accompanied them in their job. Actually, James was looking after the control card- the biggest responsibility. Everyone was already a bit tired and ready to finish but still one lap to go. Trekking with feeling of accomplishment - 10 km along the beach and we’re there, at the finish line of Geoquest on the second position. For James that was first long Geoquest now he proved himself to be also an endurance machine, for Jarad it was forth or whatever Geoquest he again had a great race and made one more step to win (after last year 3d place), Serge had great performance with minimum navigational mistakes and again proved himself as a consistent and very fit navigator. Maria had a great time feeling nicely and comfortably with very strong, helpful and outstanding in all aspects team. For our support crew it was really hard times to help not the very well organised bunch of racers and we very much appreciate your help, guys! 100% we could never do it without you. Special thanks to Shotz nutrition and Moxie gaiters- we choose them for the exceptional quality and recommend to all adventure racers! Overall experience was fantastic, a bit of challenge, a lots of fun, great team and excellent course. Geocentric again organised terrific event and we’re looking forward to new adventures!